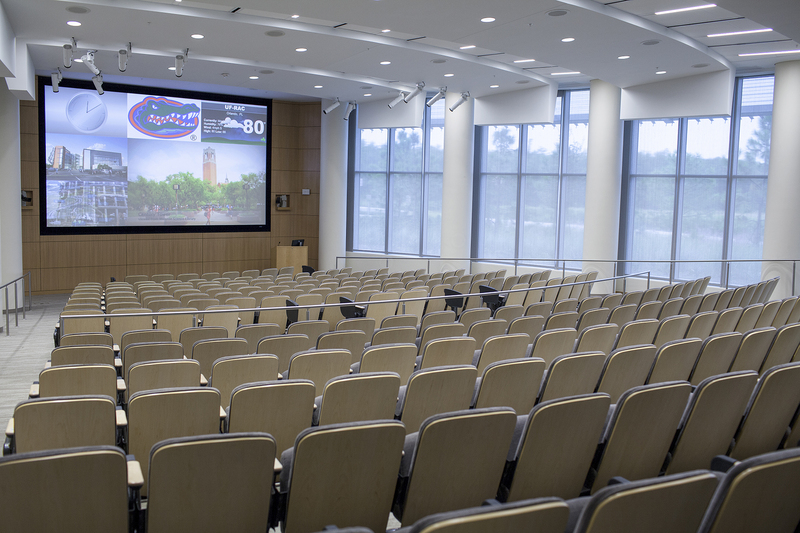 A new University of Florida research and education center brings to the Orlando area vital research on new therapies and cures, increased opportunities for participation in clinical research and enhanced access to professional and graduate pharmacy education. “The new center harnesses the resources, expertise and research capabilities of multidisciplinary teams, bringing together renowned researchers, clinicians, teachers and students with the ultimate goal of providing effective therapies and improving health for patients,” said David S. Guzick, M.D., Ph.D., UF senior vice president for health affairs and president of the UF&Shands Health System. 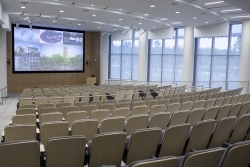 In addition, the facility is built to satisfy requirements of the Leadership in Energy and Environmental Design, or LEED, certification program of the U.S. Green Building Council, which honors energy efficiency, resource conservation and pollution reduction. 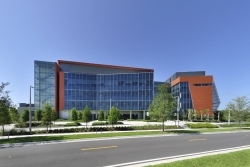 The center’s proximity to the Sanford-Burnham Medical Research Institute, Nemours Children’s Hospital and other health care organizations within the Lake Nona medical city complex and the wider Orlando area will foster collaboration that stimulates innovative approaches to research and patient care. 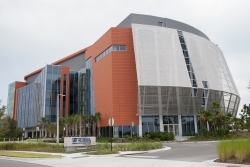 “We, and the other major partners at Lake Nona, put down roots not to reproduce what we already have, but to originate what we all wish for: Research and innovation that elevates our ambitions, magnifies our strengths, accelerates our achievements and ― lest we lose sight of the most important goal ― benefits society at large,” said UF President J. Bernard Machen. 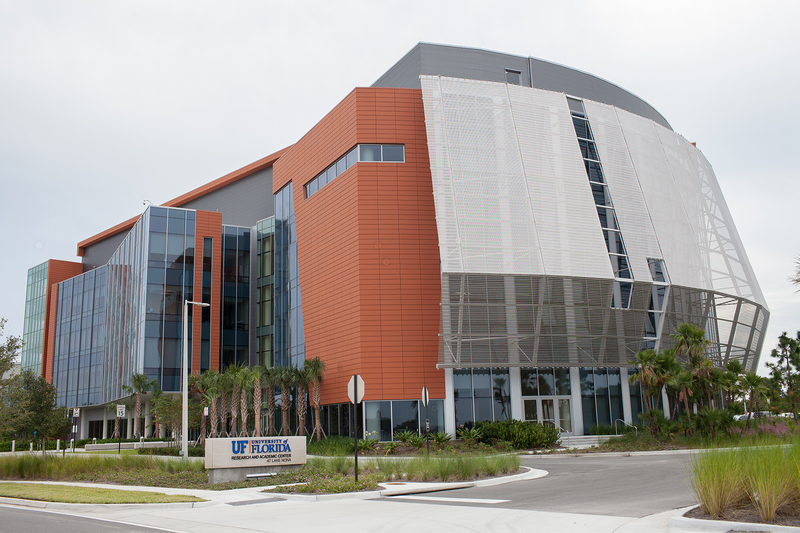 The UF College of Pharmacy’s Center for Pharmacometrics and Systems Pharmacology, housed at the new facility, is among the first academic centers in the nation to adopt sophisticated mathematical modeling and computer simulations to mimic clinical trials of new drugs. Simulated trials allow researchers to avoid investing unnecessarily in drugs that are unlikely to be of benefit. The result is that resources and research efforts can be better targeted toward drugs that have the potential to help millions of people, and the drugs that emerge from the process will be more likely to receive quick approval from the U.S. Food and Drug Administration. The pharmacy research center complements the education efforts of the College of Pharmacy; Ph.D. students and postdoctoral fellows will complete their training in the new center. The new facility also allows expansion of the UF professional Pharm.D. program from 200 students to 280 over four years. 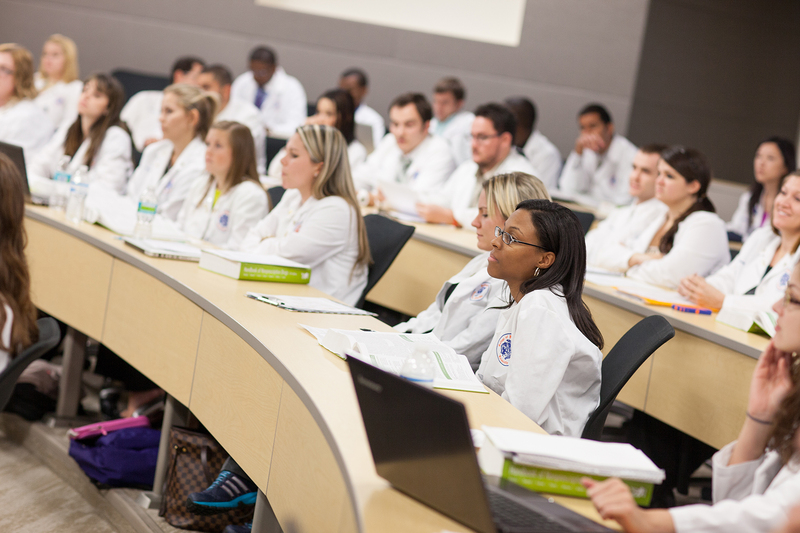 Student pharmacists at Lake Nona receive the same curriculum as classmates in Gainesville, Jacksonville and St. Petersburg. 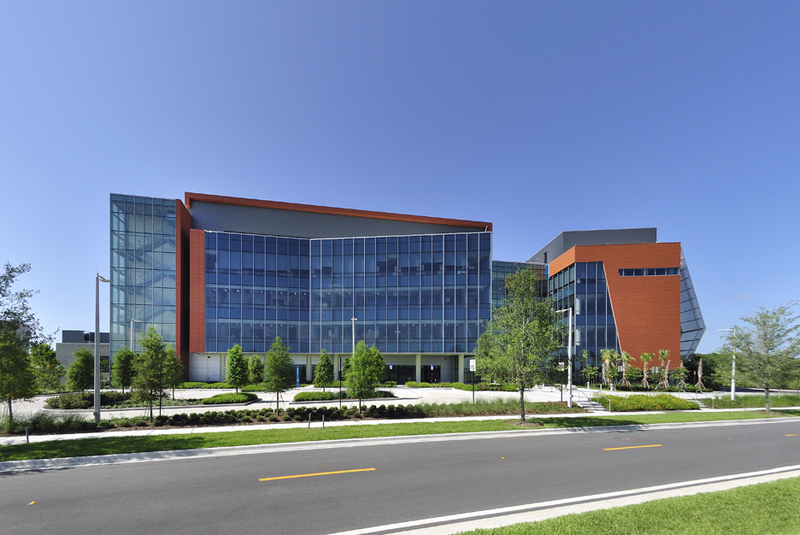 The Orlando-based students also will have access to research opportunities available at the UF Lake Nona campus and with its Medical City partners. The UF College of Pharmacy Medication Therapy Management Communication and Care Center at Lake Nona is staffed by faculty, pharmacists and pharmacy technicians. Through the telehealth call center, student pharmacists gain experiential training in comprehensive medication reviews for Medicare patients and their health care providers. The UF Institute for Therapeutic Innovation focuses on developing and testing new treatments and cures for a variety of infectious diseases caused by drug-resistant pathogens. The institute’s work in basic biomedical research and clinical trials dovetails with efforts by the Infectious Diseases Society of America to have 10 new anti-infectious disease drugs on the market by 2020. The work has far-reaching implications for the practice of medicine, notably with respect to surgeries and organ transplantation, procedures that rely heavily on infection control. Supported by more than $40 million in funding, primarily from the National Institutes of Health’s National Institute of Allergy and Infectious Diseases, the Institute for Therapeutic Innovation has created more than 30 new well-paying jobs in the region through faculty and technical positions. “Our economic footprint in the area is going to be substantial, and so will our scientific stamp,” Drusano said. The UF Institute on Aging and College of Medicine aging and geriatric research department clinical research unit at the Lake Nona center will allow thousands more Floridians to take part in clinical and translational research studies aimed at improving the health and independence of older adults. Residents of Orlando and its environs will be better able to take part in ongoing and new clinical studies. Existing studies on the Gainesville campus include the LIFE study, aimed at determining whether physical activity or health education can prevent or delay physical disability in older adults; and the TTrial, which seeks to determine whether administering testosterone to men who have depleted levels can help improve health and mental, physical and sexual function. The ability to broaden the pool of study participants to more of Florida’s residents will help strengthen the reliability of data collected and the validity of conclusions drawn from clinical studies. The UF Clinical and Translational Science Institute through its Community Engagement and Research Program will help increase participation in clinical studies such as the Institute on Aging’s studies and others by connecting patients with a wide range of clinical trials.